As part of the research for her new solo project (Un)Covered, Zosia will be offering a morning class. Combining improvisational and release based technical phrases we will explore how we embody our relationship to the outside world and our identity, through, or in-spite of, what we wear. 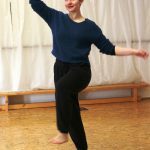 Zosia is primarily interested in the relationship between improvisation and set material and how we might find ways to keep the same autonomy, embodiment and playfulness in both practices. Expect floor work, led improvisations, fun sequences and a bit of discussion. Class is £4 drop in, £18 for 5 classes and will take place at Chapter, Lloft, 9.30-11am each day. Zosia’s residency at Chapter’s Loft is the initial research into a new solo performance about women across cultures. Drawing on her experiences in Egypt and in collaboration with Egyptian performer, Aly Khamees, Zosia is aiming to create a work which challenges our preconceptions and prejudice around freedom and choice, with clothes as a starting point. (Un)Covered will be a solo dance theatre performance exploring who we are as women inside our clothes. How our choices reflect and respond to our lives, and the various degrees of freedom, oppression, and influence affecting us. How these issues connect us all, across borders and transcending cultural difference. On Friday, 5th August at 5pm, Chapter Lloft, Zosia invites you to join her in the studio to share with you some material created during the week and to join a discussion about the new work. After Chapter and some time at Torch Theatre Milford Haven, Zosia takes her research back to Cairo where she hopes to finish and premier the work.